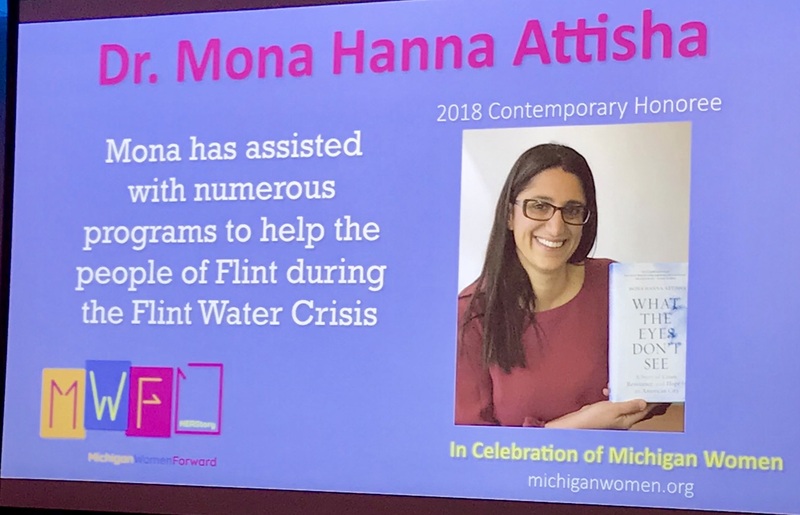 Michigan Women Forward 2018 Contemporary Honoree and GHHS Member, Dr. Mona Hanna Attisha was inducted into the Michigan Women’s Hall of Fame on October 16, 2018. It was just a few months after starting medical school that I heard about the Flint water crisis, and the amazing Michigan State University College of Human Medicine alumna Dr. Mona Hanna-Attisha, who helped to expose the effects that lead was having on the local children. Dr. Mona, as she is affectionately called by many, is a figure of inspiration and hope for the Flint community. As a student in the Leadership in Medicine for the Underserved program, I knew I was heading to Flint for my third-year clinical rotations and was beyond excited to have the opportunity to learn and serve in a community that had so much to teach me. Over the past year, I have seen many organizations striving to make a positive change in the Flint community and programs being established to fight against the difficult situations around them. It’s a humbling opportunity to be here at such a pivotal point in Flint’s history and future. I cannot wait to see how the city continues to recover and rise up after this crisis. 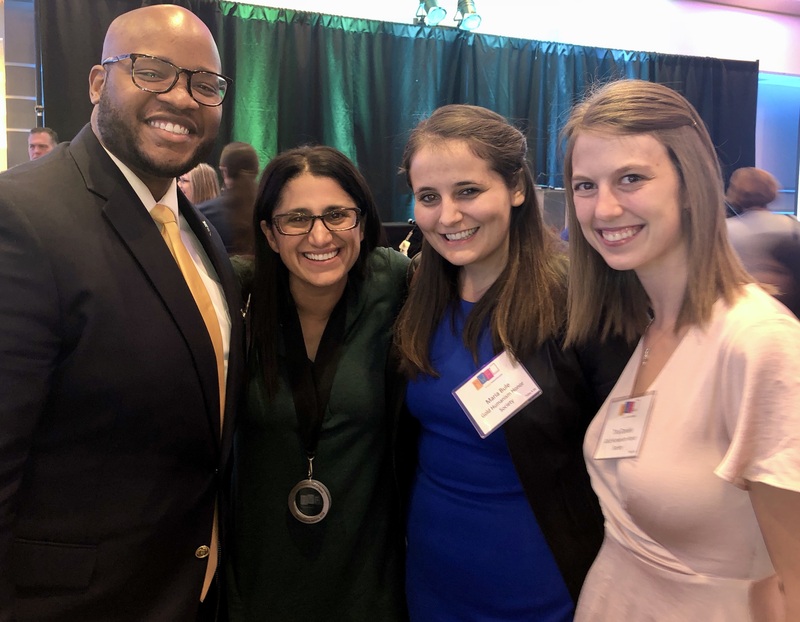 Three GHHS student members from Dr. Mona Hanna-Attisha’s alma mater attended the ceremony: From left to right, Ugochukwu Chika Agbakwuru, Dr. Hanna-Attisha, Maria Bule, and Tina Daniels. 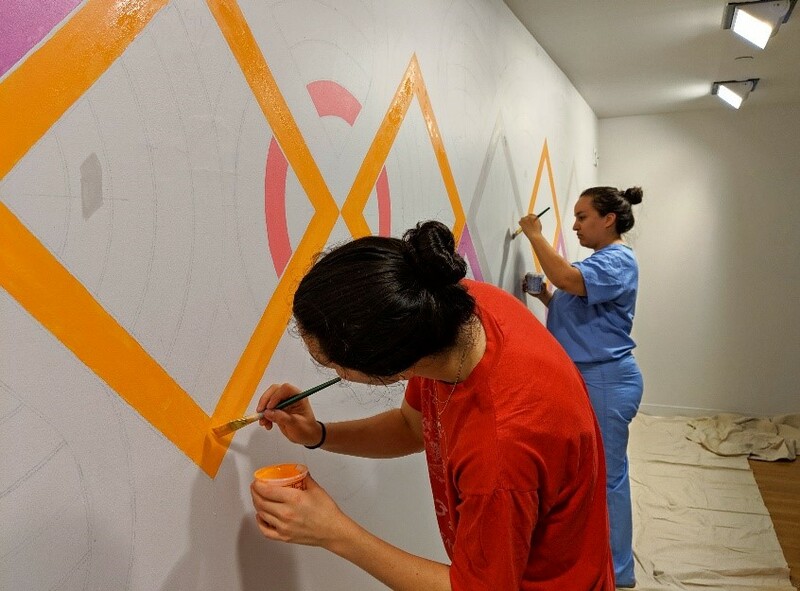 After being inducted into the Gold Humanism Honor Society a few months ago, I was not surprised to find out that Dr. Mona was a member of the society as well. She exemplifies all the qualities of a compassionate and empathetic physician: listening to her patients and their parents, hearing their stories and advocating for them. The opportunity to attend Michigan Women Forward, Michigan Women’s Hall of Fame induction as a Gold Humanism Honor Society representative to honor Dr. Mona was a great privilege. As an aspiring pediatrician, I was moved by Dr. Mona’s words that “Pediatrics is about protecting the potential of the child.” I look forward to taking part in a career in medicine in which I will not only serve my patients but protect them and help them grow. I thank Dr. Mona for all her efforts in preserving the tomorrows of children in Flint and inspiring us all to be vocal, loud and persistent aspiring physicians and community members who will not only be aware of the injustices around us but will use our voices to make the world a better place.